The TM-6 upgrade was driven by the feasibility assessment conducted by David Boggs confirming that high resolution transient electromagnetic data could be acquired simultaneously with spatially varying TMI and TFMMR data using the SAM technology principles. With DGPS now capable of delivering cm positional accuracy, the requirement for an odometer system was overcome in even the most demanding sampling applications. A Larmor counter was specified that would permit the measurement of transient electromagnetic decay signals from conductor sources as small as a 20 mm projectile to be measured. Ron Bradley engineered an enhancement to the Steve Lee statistical Period Counter to fulfil this requirement. Ron overcame the variable count rate property inherent in a Period Counter by designing a statistical Frequency Counter that could be precisely synchronised with GPS time. The measurement performance was also increased to 0.04 nT at a 2400 Hz sample rate. 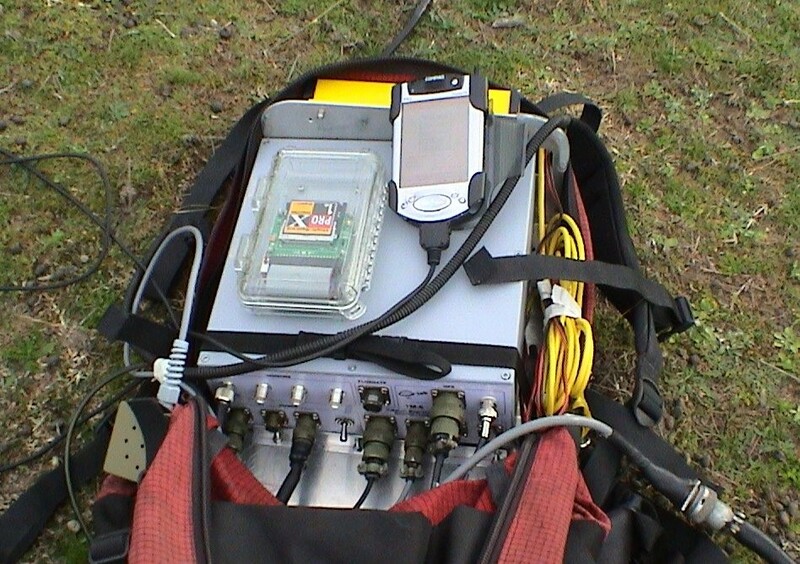 Each measurement was able to be time tagged to 10 μS precision synchronised with GPS time. Up to four Cs magnetometer sensors cold be logged simultaneously. The processing power and storage capacity were also increased permitting the use of real-time navigation aids, real-time signal stacking where required and digital recording at very high data rates. The TM-6 has proven most effective in acquiring multi-parameter SAM data for geological mapping and mineral exploration applications from ground based and airborne platforms. It has been demonstrated capable of detecting UXO down to 20 mm projectile size using both magnetic and electromagnetic parameters. It has also been adapted to the method known as SAMSON enabling transient Total Field EM signals of sensitivity as low as 0.05 picoTesla to be recorded after real-time signal stacking of multiple waveforms. The development of SAMSON earned Andrew Duncan, Malcolm Cattach and Steven Griffin, the 2007 Laric Hawkins Award for for the most innovative use of a geophysical technique from a paper presented at the ASEG Conference.